This historical novel from a Japanese perspective weaves together a story that includes key events in Japan's war with China and later in WWII with Allied Forces. These events include the Nanking Massacre, atrocities committed by Unit 731 in Manchuria, Battle of Iwo Jima, Hiroshima atomic bomb, and suicide attacks carried out by Japanese special attack forces including those by ohka (manned rocket-powered glider), kaiten (manned torpedo), shinyo (explosive motorboat), and battleship Yamato. The novel's Epilogue states that "with the exception of the character names listed in the front of this book, all names and incidents are factual" and "all incidents of the Kamikaze deaths and ships damaged and destroyed are factual except for the characters." The back cover also explains that "the book remains true to all of the major historical events of the Pacific theatre of World War II." However, this novel contains numerous errors related to Japan's Special Attack Corps to the point of casting great doubt as to the book's entire historical backdrop. Midori, a Japanese midwife and General Nakura Tanoka's wife, and Commander General Hironaka, a hardened Army official willing to sacrifice the nation's youth in battle, are the novel's two main characters. They both have three sons, all who lose their lives during the war. Hironaka's sons all participate in suicide attacks with his youngest son Yuka dying in an unsuccessful shinyo motorboat attack at Okinawa and his oldest son Schino dying in a kaiten attack that sank the heavy cruiser Indianapolis on July 29, 1945 (actually two torpedoes hit and sank the ship ). His middle son Hamano served as a junior officer on the suicide mission of battleship Yamato from mainland Japan toward Okinawa, but he managed to survive and was rescued by the hospital ship USS Comfort (AH-6). Midori's youngest son Nomuro piloted an ohka glider bomb into Comfort, which also killed Hamano (Comfort actually hit by conventional kamikaze aircraft with bomb and not by an ohka ). Several erroneous basic facts regarding Japan's Special Attack Corps get included in this historical novel. A chapter on the Battle of Okinawa states that "just 1,035 Kamikaze pilots," some as young as 13 years of age, subjected the fleet to over 1,500 suicide attacks (p. 88). This could have been true only if some kamikaze pilots flew more than one plane at the same time, but actually the number of 1,035 only includes Army pilots who died in suicide attacks during the American invasion of Okinawa and does not include over 2,000 Navy pilots who died in suicide attacks . In actual history, the youngest Navy kamikaze pilot to die in battle was 16 , and the youngest Army pilot was 17 . In this historical novel, General Onishi leads the Cherry Blossom Corps that plans to launch ohka glider bombs from Betty bombers. The ohka pilots train in March 1945 at Ronoike Air Base near Chiran Air Base in southern Kyushu. In real history, Vice Admiral, not General, Takijiro Onishi formed the Navy's Kamikaze Special Attack Corps in the Philippines in October 1944. He never had any direct involvement with the 721st Air Group that included ohka pilots, who actually trained at Konoike Air Base in Ibaraki Prefecture, far to the north of the supposed location of Ronoike Air Base in southern Kyushu. Regarding kaiten, the book incorrectly states that more deaths were logged in training than in combat (p. 112). Actually, out of the 106 kaiten pilots who lost their lives, 15 were killed in training accidents . Midget submarines and kaiten manned torpedoes get mixed up in the novel with a inaccurate reference that Japanese midget submarines, first launched during the Pearl Harbor attack, were human torpedoes that were steered into the side of a ship and killed its pilot in the blast. Midget submarines, unlike kaiten human torpedoes that did crash into ships, carried two torpedoes in front that were launched at targets, and the two midget submarine crewmen in each midget sub planned to rendezvous later with the mother submarine that launched them. The novel's pilots get into the ohka before the Betty bomber mother plane takes off, but in real combat the pilot crawled into the ohka cockpit when the plane neared the intended target . The ohka weapon had an actual range of about 23 miles . However, the novel incorrectly gives the release point as 50 miles from the target, and it states that the ohka will reach the target in 30 seconds even though this is impossibly quick as it starts its glide at 219 miles per hour and then finally reaches a speed of 621 miles per hour during its dive. The novel's chronology at times makes little sense, since some chapters skip back in time with no explanation. The use of Japanese female names (e.g., Motoko, Masako, Yoshie) for males in the novel and the use of foreign names for Japanese characters (e.g., Italian name of Schino, Chinese name of Madame Liu, Indian name of Swansi) can be disconcerting. Spellings also often get changed by one letter from the actual Japanese names (e.g., Tanoka instead of Tanaka, Ronoike Air Base rather than Konoike). Sometimes correctly spelled names get spelled incorrectly in other places within the book (e.g., correctly as Yasukuni Shrine but incorrectly as Tasukuni, Yasakuni, and Yasunkuni; correctly as Shinyo but incorrectly as Shinya). Some plot elements lack believability. A thousand stitch belt (senninbari in Japanese), whose origination dates back to the Sino-Japanese War of 1894-5, often was made during WWII by a Japanese woman with stitches from a thousand people in order to give to a son or other family member going into the military or to the battlefront. In this historical novel, the far-fetched thousand stitch belt dates back 664 years and contains the names of almost a thousand warriors with Midori's sons being the last of the line to have their names stitched onto the belt. Other smaller incidents seem impossible such as when Hamano, an officer aboard battleship Yamato when she sank, gets picked up by the American hospital ship Comfort and then supposedly disguises himself as a Chinese POW in order to work aboard the ship assisting patients. Other than the shinyo motorboat pilot Yuka, Midori's three sons and Hironaka's two other sons are unrealistically portrayed as cowards against the war even though almost all tokkotai (Special Attack Corps) members demonstrated real bravery in attacking enemy ships despite almost certain death. Hamano feigned a wound when battleship Yamato came under enemy attack, and he went to his quarters inside the ship in order to hide. The kaiten pilot Schino wrote in the last letter to his father Hironaka that he was "a scared little boy whose life has done no good for a single person." Nomuro in the ohka cockpit cried for his mother to somehow rescue him and ended up urinating in his pants prior to being released over the target. The author Dr. C. Thomas Somma has been a Professor of Medical Technology for over 30 years at Old Dominion University. 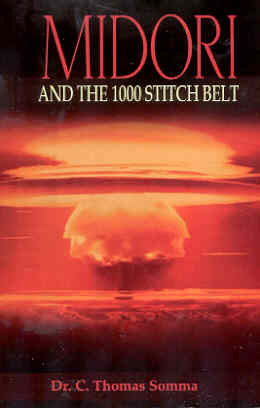 Midori and the 1000 Stitch Belt is his first published novel, although he also has published a book of short stories entitled Requiem (2009). The back cover of the book expresses his commitment to expose the hidden horrors of the Japanese Army, and this novel vividly portrays atrocities committed during the Nanking Massacre and Unit 731's experiments on humans. However, these subjects do not have a direct relationship to the topics explored in the chapters on Japan's Special Attack Forces that carried out suicide attacks, although Midori and Hironaka have connections to both through their sons. Midori and the 1000 Stitch Belt falls far short of its claim that all names and incidents are factual except those of the fictional characters introduced at the beginning of the book. Even when considered solely as fiction, the main characters do not have true-to-life personalities but rather seem more like embodiments of political and personal viewpoints from a Western, rather than a Japanese, perspective. 2. Harper 2001, 43-6, 58; Rielly 2010, 250. 4. From chart on exhibit at Kanoya Air Base Museum. 5. Based on Army special attack pilots who died from March 26, 1945, to the end of WWII (Chiran Tokkou 2005, 153-220). 7. Hagoromo Society 1973, 28; Naito 1989, 142; O'Neill 1999, 154. Chiran Tokkou Irei Kenshou Kai (Chiran Special Attack Memorial Society), ed. 2005. Konpaku no kiroku: Kyuu rikugun tokubetsu kougekitai chiran kichi (Record of departed spirits: Former Army Special Attack Corps Chiran Base). Revised edition, originally published in 2004. Chiran Town, Kagoshima Prefecture: Chiran Tokkou Irei Kenshou Kai. Harper, Dale P. 2001. Too Close for Comfort. Victoria, Canada: Trafford Publishing.